Twenty-five students with five guardians from Kopila Valley School of Surkhet shared their infectious teamwork and energy with us this Dashain by participating in 6 day volunteer program in Bhattedanda, Dhulikhel from the 25th to 30th October. The grade ten Kopilians, traveled 16 hours on a bus to help build a rammed earth wall for Sanu Maya Tamang’s house— one of ABARI’s post-earthquake reconstruction efforts. Sanu Maya Tamang, is a single mother, constantly been discarded for being a widow and raising a differently abled child. With a daily wage of NRs. 250, she has a hard time managing her daughter Muna (age 13). However, her son, Bijay (age 10) eagerly takes on his mother's responsibility to manage their house, farm and their livestock. The program began with a workshop organized by Francesc Masso, a building engineer from Spain specializing in sustainable earthen architecture. 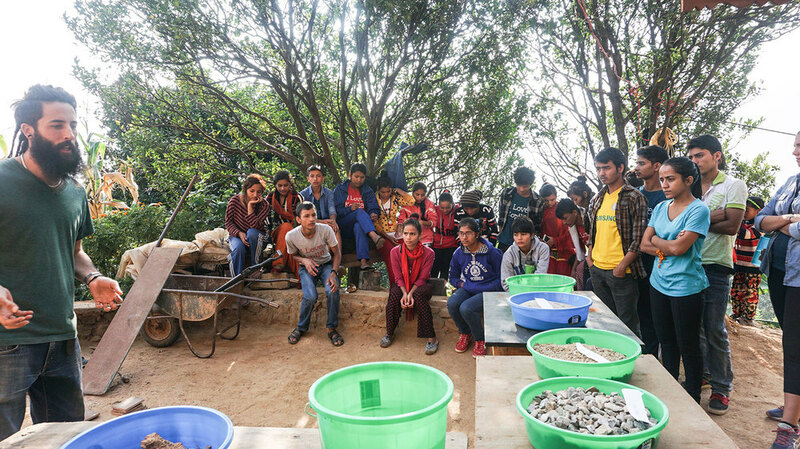 During the workshop, they were encouraged to touch, feel and smell the materials such as gravel, clay, sand and stone chips in the already built rammed earth building of Dhulikhel Learning Center. Mr. Masso spoke about the main concepts of rammed earth and composition materials, and also showed various video documentaries and presentations. The students also collected soil from around the site to conduct sample soil tests and analysis. The students prepared different ratios of materials forthree sample blocks of rammed earth and analyzed their strength and feasibility. The theoretical and practical learning of the program was also accompanied by various refreshing games and group activities organized by ABARI’s intern Brianna Bussinger. The children also got a chance to do relax with some evening yoga and meditation with Yogi Yam. They also experienced the dos and don’ts of setting up tents in the wet and windy weather of Bhattedanda. Construction of a house is the synergy of a lot of elements—raw materials, financial and human resources, skill and time. The students learned about the focused energy- both body and mind in building a house through ABARI’s technical employees: Hemu Chaudhary, Suresh Chaudhary, Jodha Sharma and Padam B.K. At the end of the sixth day, they joyfully opened the form-work of the 6 feet 6 inch rammed earth wall. With hope in their eyes, Sanu Maya didi with her two children Muna and Bijay touched the cool solid brown wall. The students received certificates for their contribution and were heard saying, “We will be back to meet Sanu Maya didi again.” Thank you Kopilians for all your hardwork and enthusiasm!